It was fun to watch but also sad because I was not standing right by their side this year at SXSW - my life isn't *really* ruined. Wayne Coyne told the SXSW crowd not to envy where they couldn't be, but to appreciate where they were and who they were with instead. This reminded me of my first SXSW trip... where Tony Ham was present (of course). We were babies in the digital sphere, we knew no one. It was 2009 or 2010, I was at SXSW on a press pass and had not one "VIP party" invitation. FYI, all the best parties are by invitation. However, this had never stopped me before, and it wasn't going to stop me now, so I started a "snowball party" - as I called it. We were walking down the street with nowhere to go and would pick up strays and go from there, party to party, or bar to bar, whether we got in or not, we would be our own fun. Sounds stupid, it wasn't, it worked. 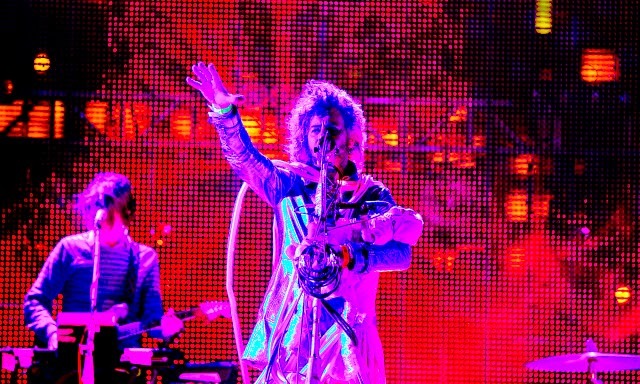 Tonight, Tony is up close and personal with Wayne Coyne (of The Flaming Lips, duh). This is his last SXSW before he heads to Australia and I'm sad to not be there. He is also with my co-worker and good friend Kriselle, they are enjoying this moment sans Leyla. But they did get me a 3M shield for my iPhone 6 from the #LifeWith3M house (or party). My first experience with The Flaming Lips is quite memorable. I was in college and I worked at the local bar where bands played, the only one with a decent stage for 200 miles. I was a clever kid, I never scheduled a class before 10 AM and I was always finished by 2PM. Everyday I went to the gym and worked out for an hour or two... and then I went straight to the bar, it opened at 4PM. It wasn't crazy that I was at the bar daily, I worked there too, but I drank from 4PM until 8PM, then nightly after 10PM, unless I was working. I would joke that I drank 8 days a week, which was true because most days I slept off my afternoon hangover and drank again later that evening. Studying was a piece of cake, I did that when others were sleeping and the bars were closed. In any case, back to the point! I had friends who were regulars, some students and some not. My friend Matt was a regular, I can't be certain whether or not he was a student, but he was a regular. He was there daily at 4PM just like me. He looked like a nerd and he drank himself stupid, the only reason I remember him is because he rocked the same barstool every single day and he introduced me to The Flaming Lips. I don't remember the season, or the reason, but Matt was missing from the bar. I wondered where he was and the kids told me he had checked himself into detox -- sounds rough, but not if you're living in Southern Illinois. I shrugged my shoulders and expected him back, when I'd surely welcome him with a shot of Jaegermeister. When he came back, he had mix tape for me, on it were two things I remember and many others i don't. Matt introduced me to Liz Phair and The Flaming Lips. It's weird because I have no idea whatever happened to Matt but I always think about him when I listen to The Flaming Lips. Did he live or die, I don't know. I know many others never made it out alive (I still remember them everyday) but I hope he's OK, I hope they're all OK. If you're from there, you understand my seemingly cavalier attitude, if you're not, you don't and I can't change that.